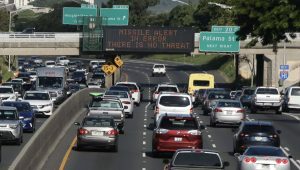 It took 38 minutes for the state of Hawai‘i to issue the “False Alarm” message. Later, talking to CNN, Hawai‘i Governor David Ige said, “Like everyone else, I woke up to the message.” He meant literally, as the alert went out at 8:00 a.m. But the question is, did the message, in fact, wake people up? Those minutes of terror and tears in Hawai‘i are a grim reminder that we all, every one of us, live on the edge of the end of life for us and everyone we love. That’s lesson one—the nuclear threat is real, it promises death to entire populations, it could happen at any second, and it gives you 20 to 30 minutes, at most, to say your good-byes. The second lesson is no less frightening. The message was a result of human error. In this case, the error was in the public alert system—there are literally dozens and dozens of ways human errors could lead to an actual nuclear weapons disaster. Accidents, miscalculations and false alarms have nearly done so many times. For the same reasons we don’t generally contemplate the ever-present nuclear threat, we also don’t know about the many near-misses: times in the last 30 years when one country or another almost launched nuclear war due to human error, communication glitches, or other flaws in the system. And then there is a third lesson that goes to the deep denial and ignorance our current nuclear policy depends on. Following the false alarm, a Senator appeared on TV to remind people that if there is ever a real attack, “we should shelter in place.” In reality, it matters little what you do if there is an H-bomb attack. If it makes you feel better to shelter in place, go for it. Just be aware that if the bomb detonates within a few miles of you, the place you shelter in will likely be vaporized, and a millisecond later, you will, too. It sounds horrible, but with any luck, you won’t ever know it. I say “with any luck,” because, as has been said before, possibly by Soviet leader Nikita Khrushchev, in the case of nuclear war, the survivors will envy the dead. This is not exaggeration or hyperbole because firestorms, radiation, disease and famine inevitably follow any “nuclear exchange” as the NPR antiseptically calls it. The irony writ large is this. The Nuclear Posture Review prepared for Donald Trump is the document that broadcasts our official nuclear weapons policy and outlines plans for the US nuclear weapons complex, our stockpile, and our delivery systems. The new NPR warns Congress that billions of dollars will be required to upgrade nuclear weapons, build newly designed nuclear weapons, and construct new nuclear bomb plants—in short the NPR adopts a threatening and belligerent posture, one that increases the risk of that ballistic missile attack for every one of us. The NPR is striking in its capacity to completely ignore the impact of US nuclear policy on the behavior of other countries, allies and enemies alike. The document cites activities in North Korea, China and Russia as though they have made decisions in isolation; it ignores the fact that virtually every one of their actions is a reaction to the US’s $1.7 trillion plan to modernize its nuclear weapons, infrastructure, and delivery systems. There is a clear and direct correlation between the false alarm in Hawai‘i and the release of the Nuclear Posture Review. The NPR does not just describe the world we live in; it forms that world. In this case, the Trump Administration continues to escalate bipartisan efforts to expand US nuclear weapons capacity. There is a clear and compelling relationship between the NPR and the risk we all bear every day, a threat most choose not to think about, the denial of which makes it no less real. An intercontinental ballistic missile launched from Russia or a Russian sub will reach its target in 30 minutes or less. That’s the maximum notice we might have. A thermonuclear war will destroy not only cities and military bases, but will initiate a nuclear winter rendering the earth uninhabitable. We don’t have to load that terrible, existential risk onto the shoulders of our children and grandchildren. We can insist that Congress and the Administration work together to craft a Nuclear Posture Review that reduces the nuclear threat that pursues complete disarmament in good faith, an obligation the government assumed in 1969 that prepares for the entry into force of the Treaty on the Prohibition of Nuclear Weapons. Another world is possible. Hawai‘i reminds me that it is necessary. The Nuclear Posture Review should be far more terrifying to us than the Hawaiian false alarm. The NPR is not a false alarm. It is a real and present danger. It escalates the risk for all of us and dooms future generations to live under the shadow of a mushroom cloud—one we have created ourselves. —Ralph Hutchison is Coordinator of the Oak Ridge Environmental Peace Coalition in Tennessee and drew out attention to the original spelling of Hawai‘i including the ‘okina.